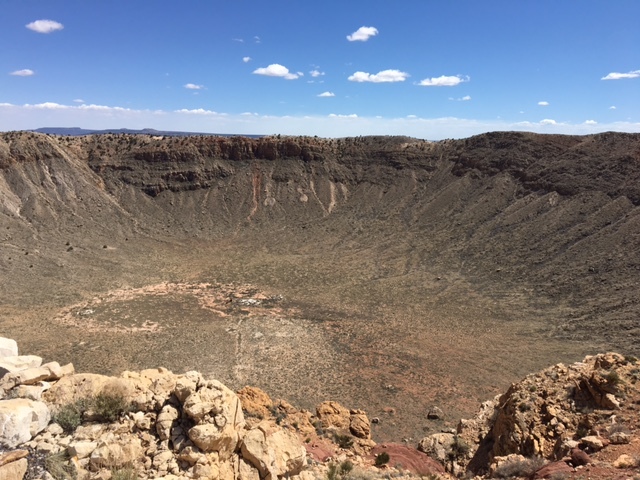 Meteor Crater – Live MoHo! 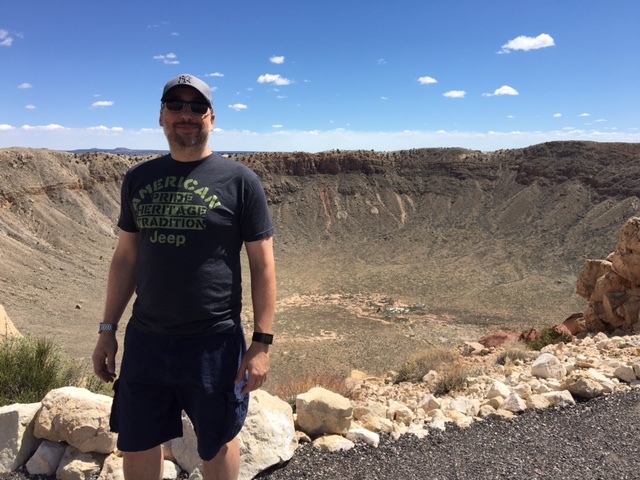 Ever since I saw Starman as a kid, I have wanted to see the meteor crater. Today, we arrived! 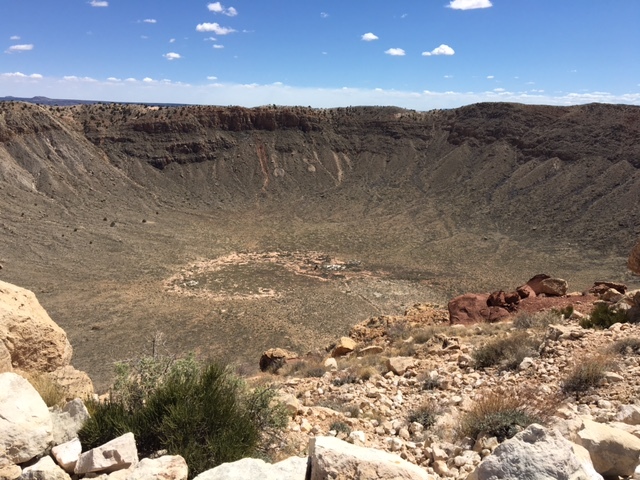 Meteor Crater Arizona is the best preserved meteor crater on earth and was also the first confirmed meteorite impact crater. The crater was formed 50,000 years ago when an iron-type meteorite that was approx. 150 in diameter slammed into the earth at 26,000 miles an hour. In only 10 seconds a crater 700 feet deep and nearly 4000 feet across was gouged out of the ground in an explosion equivalent to 20,000,000 (20 megatons) of TNT. For many years, the crater was assumed to have been volcanic in nature, including an official statement by the head of the US Geological Service in 1891. But several people including Daniel Barringer believed the crater to be from a meteor. Barringer believed this hypothesis so strongly that in 1903 he staked a mining claim on the crater, planning to extract the mass of iron that he assumed was at the bottom of the crater. He raised funds and spent most of the next 27 years looking for the main meteorite, both drilling exploratory holes and even some mine shafts. Impacts were poorly understood and he did not realize that most of the meteor vaporized during the impact. However, his careful exploration provided extremely useful documentation about the impact site. His family still owns the crater, and turned it into a museum and tourist site that we see today. Its possible to walk to an observation platform at the top of the crater rim, where old mining equipment can still be seen on the crater floor below. 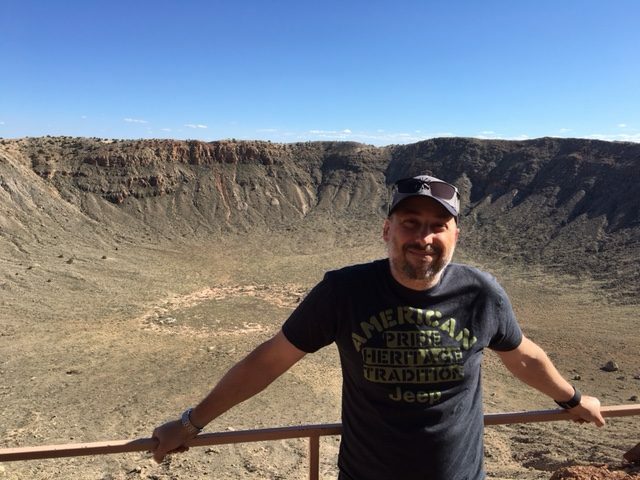 The views – and the winds – up here are incredible! In spite of the work done by Barringer, there still remained skeptics of the impact theory. 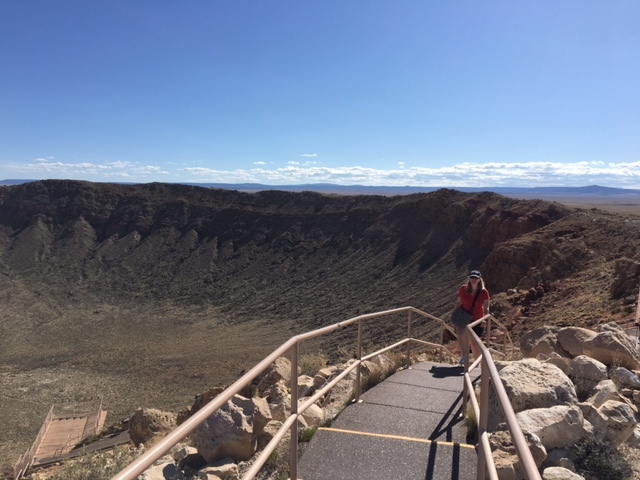 In 1960, Eugene Shoemaker put the question to rest when he confirmed the crater shared similar features to nuclear bomb craters he had been studying in Nevada. A dead giveaway was the presence of shock quartz, which can only be formed by nuclear explosion, impact, or in the laboratory. 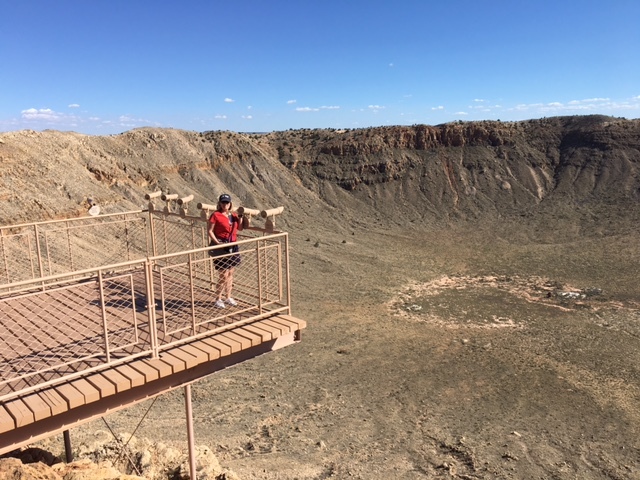 There are various observation platforms setup for viewing different parts and features of the crater, including this one that is not for the faint of heart! Its about 400 feet straight down off that platform!! 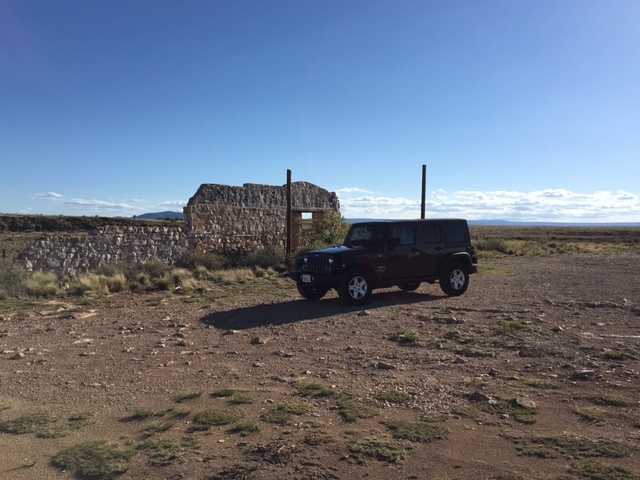 Heading back, we stopped to explore the old Two Guns/Canyon Diablo ghost town which is just one exit away (closer to Flagstaff). It was on the old Route 66 but getting there is best in a Jeep. Fortunately, we had one! Canyon Diablo’s claim to fame is that they once dug up a dead gunslinger, gave him a shot of whiskey, and took photos with the corpse. If you go here, you’ll see an old concrete arch bridge over Diablo Creek. Its fenced off and dangerous. Don’t try to walk over it. One comment about the area – it is very flat and very WINDY most of the time. On top of this, the Coconino sandstone that underlies much of the area is prone to weathering into a fine white powder they call “rock flour.” Mix that powder with the winds and you have the recipe for a LOT of grit everywhere. Be prepared to have it in your hair, your clothes, your car, etc.